ww2dbaseHermann Hoth was born in Neuruppin, Germany to an army medical officer. He joined the Germany Army in 1903. During WW1, he was promoted to the rank of captain and won both classes of the Iron Cross award for bravery. During the inter-war years, he remained in the Germany military. In 1935, he was promoted to the rank of major general and was given command of the 18th Infantry Division. On 10 Nov 1938, he was promoted to the rank of lieutenant general and was given command of the XV Motorized Corps. ww2dbaseHoth led the XV Motorized Corps during the invasion of Poland at the start of the European War; on 27 Oct 1939, he was awarded the Knight's Cross award for his performance in Poland. In the following year, he participated in the invasion of France. On 19 Jul 1940, he was promoted to the rank of general. In 1941, as the commanding officer of the 3rd Panzer Group against Russia, his men captured the Byelorussian cities of Minsk and Vitebsk; he was awarded Oak Leaves to his Knight's Cross on 17 Jul 1941 for his victories in Byelorussia. In Oct 1941, he became the commanding officer of the 17th Army in Ukraine. In May 1942, the 17th Army was driven back at Kharkov. In Jun 1942, he became the commanding officer of the 4th Panzer Army and was ordered to support the 1st Panzer Army's crossing of the River Don in order to support German efforts at Stalingrad in Southern Russia. In Nov 1942, as the German 6th Army was trapped in Stalingrad, Hoth's 4th Panzer Army was the centerpiece of Erich von Manstein's Operation Winter Storm which aimed at relieving the 6th Army; by the end of the year, the operation was deemed a failure. In Jul 1943, Hoth and the 4th Panzer Army participated in the Battle of Kursk, where his divisions, the largest tank formations ever assembled, performed extremely well. On 15 Sep, he received Swords to his Knight's Cross award. Nevertheless, the successive Russian victories blemished his record, he he was relieved of his command in Nov 1943.
ww2dbaseIn Apr 1945, Hoth was recalled to active duty. He commanded troops in defense of the Harz Mountains in the weeks of the war. ww2dbaseAfter the war, Hoth was tried at Nuremberg, Germany at the High Command trial, and was found guilty of war crimes. On 27 Oct 1948, he was sentenced to 15 years in prison. He was released in 1954 and became a writer of military history. He passed away at Goslar, Germany, in 1971. 12 Apr 1885 Hermann Hoth was born. 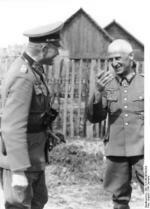 19 Jul 1940 Hermann Hoth was promoted to the rank of general. 25 Jan 1971 Hermann Hoth passed away. I too am a descendant of Hoth. We are related on my mother’s side. My mother immigrated to Canada in 1954.